Come Christmas Eve, we usually go to my mom and dad's. Everybody brings one gift and then we play that game when we all steal it from each other. Some are really cool, others are useful and some are a bit out there. My mother was a not-too-devoted atheist. She went to Episcopal church on Christmas Eve every year, and that was mostly it. Christmas Eve was a night of song that wrapped itself about you like a shawl. But it warmed more than your body. It warmed your heart... filled it, too, with melody that would last forever. 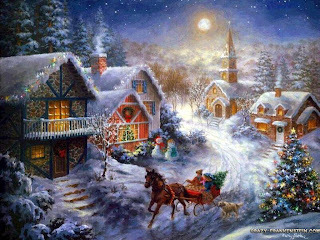 But I am sure that I have always thought of Christmas time, when it has come round... as a good time; a kind, forgiving, charitable, pleasant time; the only time I know of, in the long calendar of the year, when men and women seem by one consent to open their shut-up hearts freely. The perfect Christmas tree? All Christmas trees are perfect! Christmas was always a big holiday in our family. Every Christmas Eve before we'd go to bed, my mom and dad would read to us two or three stories and they would always be 'The Happy Prince,' 'The Gift of the Magi' and 'Twas the Night Before Christmas,' and I would like to keep that alive. Christmas is not an eternal event at all, but a piece of one's home that one carries in one's heart. According to an ancient Sardinian legend, the bodies of those who are born on Christmas Eve will never dissolve into dust but are preserved until the end of time. Something about an old-fashioned Christmas is hard to forget. I beg people not to accept the seasonal ritual of well-timed charity on Christmas Eve. It's blasphemy. Christmas is for children. But it is for grownups too. Even if it is a headache, a chore, and nightmare, it is a period of necessary defrosting of chill and hide-bound hearts. The sharpest memory of our old-fashioned Christmas eve is my mother's hand making sure I was settled in bed.